The girls basketball team from Rocky Mountain High School took on three teams this past week. Coach Ryan Boettcher was pleased with their progress, which is moving along according to the plan he made earlier in the season, which was for the girls to get as much time on the court against non-conference teams as they can, in order to hone their skills and synchronize their efforts before their first conference game. The first was game was played in Montana on Dec. 8 at Bridger High School. The girls wasted no time taking down the Lady Scouts with a final score of 53-40. Shauna Loman asks for the ball as Brianna Hocker puts up the shot for the RMHS girls basketball team in the 53-40 win against Bridger, which was played in Bridger, Mont. on Thursday. Top scorers in the game were Mandee Leonhardt and Shauna Loman with 12 points each. Brianna Hocker scored 10, Hannah Winland 6. Hannah Parker and Rachael Allred scored 5 each. Rachel Rapp scored two points, Isabel Gurrola 1. Kallee Jo Wilson sat out the game. Boettcher felt Leonhardt, Loman and Hocker did a good job picking up the scoring in absence of Wilson, who is usually a high-scoring player for the team. Although Bridger was able to land a few buckets in the end, the Rocky girls were able to prevail. Scoring by quarter for Rocky was 12, 15, 11 and 15. For Bridger it was 8, 15, 6 and 11. The girls took on the tough team from Tongue River on Friday in Dayton and fell to the powerhouse with a final score of 51-21. Wilson was back in the game, but it wasn’t enough to beat the powerful team from Tongue River. Top scorers were Hocker, 6, Allred, 6 and Wilson, 5. Leonhardt and Loman brought in 2 points each. Scores by quarter for Rocky were 3, 9, 2 and 7. For Tongue River it was 9, 11, 16 and 15. On Saturday, the girls took on Wind River at home, winning the fairly close game 49-41. Wilson was on her game scoring 17 points. Leonhardt added 9, Hocker 8, Loman 7, Allred 4, Rapp and Gurrola, 2 each. Boettcher felt the opposing coach was “switching it up” in an effort to figure out what was going to work against his girls. Boettcher thought it was a good game for the girls and a challenging win for the girls. Scores by quarter for Rocky were 13, 15, 8 and 11. For Wind River, the quarterly scores were 15, 15, 13 and 8. 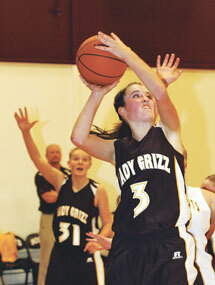 The girls will face Thermopolis tonight (Thursday) on their home court with game times at 4 and 5:30 p.m. This will be their first conference game of the season. The team will play an intra-district game against Burlington on Saturday in Burlington. Game times are 1 and 2:30 p.m. Although a 1A team, according to Boettcher, Burlington beats a lot of the 2A teams they play and should provide a good challenging game for the Rocky girls.